'Purpose & Cause' might not be for everyone but it could be for you. Benesser are a three-piece band from Sweden; I bet that pricked up the ears of all you Scandi Rock fans. They are however not at all "pink & fluffy" (copyright Derek Oliver) but instead come across as an eclectic mixture of Modern Prog/Rock and Pop. This mix translates into the band sounding at little, at times, like Coheed And Cambria, Porcupine Tree and Coldplay (but not in a boring way). 'Purpose & Cause' is their second full album and it isn't an easy musical work to get to know. Only after you've played this release a dozen times and more, does its subtle intelligence and claustrophobic musicality begin to work its strange attraction on you. There are a few songs on '...Cause' that stand out for me and that you should potentially look out for if my description of their music has interested you. One such offering would be the musically aggressive title track, with its brash and caustic guitar riffs, that are juxtaposed with quiet laid back vocal passages; and these to differing musical styles are like two beasts clashing head on, with neither coming out as the winner. Another selection would be the musically sombre and melancholically refrained question 'Who Am I?' and again the light and shade of the song is what I find so interesting about Benesser's music. Then we come to the seven minutes of dark imagery conjured up by the band on 'Closer', a song that each time I've played it, has found me coming away with a completely different feeling about what I've just heard. There's also the weird and jarring 'Turn It Right' to contend with and lastly my personal favourite 'Waterfalls', which starts off with some soothing acoustic guitar and almost choral-like vocals, that slowly build and grow into a stunningly confident and intoxicating song; it's one that always leaves you breathless and wanting more. 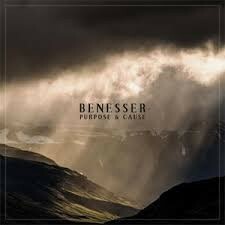 Benesser are a musically odd trio, with arrangements that (at times) jolt you out of you listening comfort zone. I do think that those readers who like to give different types music and artists a chance will get a lot of pleasure from listening to this clever and intriguing band; 'Purpose & Cause' might not be for everyone but it could be for you.